You are here: Home / Feature Articles / Unlock the Potential in your Shocks! Unlock the Potential in your Shocks! 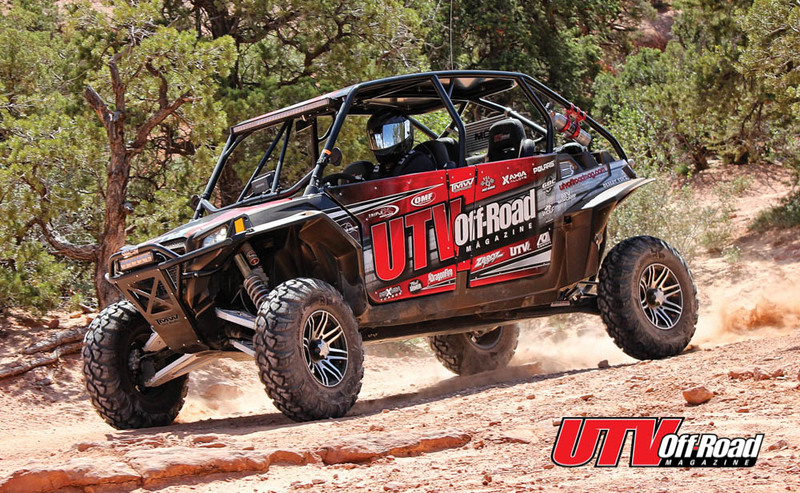 When it comes to shocks for our UTVs, we all want them to perform amazingly in every type of situation. Chances are if you own a UTV, you don’t just use it for one type of terrain. We typically take them out on trail rides where you encounter rocky or tree-rooted trails and generally travel over them at a slower pace. For this type of riding, we want a plush ride — especially if the trail you are on is all bumps. Unless you are driving on dirt roads, most trails have their share of rough driving. Would you want it any other way? We always say the rougher the better, that’s how you know you are really out and away from everything you are trying to escape from. But in reality, it doesn’t have to feel rough. Today’s sporty side-by-sides like the Arctic Cat Wildcat, Can-Am Maverick, and Polaris RZRs have upped the ante in the suspension department. In the past five years, manufacturers have doubled wheel travel from 9 inches of travel to a whopping 18 inches. This increase in travel has made the ride more bearable at any speed on any trail. Upgrading from a RZR 800 to a RZR XP 1000 is a night and day difference when it comes to hard hits on the trail. But on the normal slow speed trail rides, the small trail junk you encounter, you will feel worn out over a period of a few hours. If wide-open desert riding or sand dunes is your thing, you are faced with long whoop sections, steep transitions, jumps, ledges and more requiring the shocks to absorb big impacts at higher speeds. Typical UTVs outfitted with either Walker Evans shocks or Fox shocks are not intended to excel at everything, but rather to do everything well. For the most part they do, but as they say, there is always room for improvement. To the shock manufacturers’ defense, they build a shock package that the OEM has tested over a variety of terrain and develop a setting that works well in all situations. Typically, the shocks are equipped with only compression clickers, providing the ability to soften or stiffen up the ride. To get a better slow speed ride over the chop, you dial the compression back; for the sand dunes, you stiffen the compression for harder impacts. Even with this range of adjustment, it’s difficult, if not impossible, to get the optimal ride we really desire. Wouldn’t it be great if you could have the best of both worlds in one shock? Well, as of matter of fact, you can. Shock Therapy, located in Wittman, Arizona, just may have the answer for you. The bright minds at Shock Therapy have been after us awhile to work their magic on a set of shocks for us. When our schedule cleared up, we decided to give it a try. We brought over our 2012 Polaris RZR XP 4 900 equipped with Walker Evans shocks. Over a year’s time of driving the XP 4, we have come to expect more out of our shocks. Crawling in the rocks of Moab, the bumpy trails got the best of us after a few days, and we were feeling a little beat up. Big impacts and most jump landings in the dunes bottomed out the shocks frequently, even with the compression dialed up. The goal was to bring both of these issues into check. We wanted a plusher ride over the small chop and medium-sized trail debris. And, of course, we wanted to drive the car like we like to drive it – fast, without injuring our spine. Did we mention that it has a Turbo? Fast off-road vehicles are only as good as their suspension. For example, take two identical machines off the showroom floor. Properly tune the shocks on one of them, and add more horsepower to the other, leaving its suspension stock. The vehicle with the properly tuned suspension will outperform the other one hands down over any type of rough terrain. With our goals in mind, we drove the RZR out in the desert with a good variety of everything we would encounter on a typical day out on the trail. With our baseline ride out of the way on our stock shocks, it was time to open them up and see what improvements could be made. To ensure the shocks are set up the way you like them, Shock Therapy offers two ways of getting your shocks dialed in. If you live near Arizona, you have the option to bring your vehicle to their shop where they will rework your shocks and you can test them on their 5-1/2 mile test loop through the desert. For those of you out of state, you can send your shocks to them and they will work their magic and send them back. 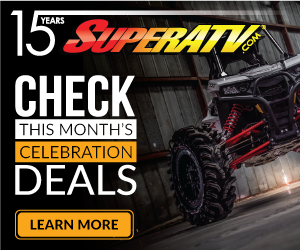 For as low as $500 for most UTVs, Shock Therapy will add their kit, which includes a piston change, new valving, new oil, oil flow improvements, and compression adjuster changes. They currently have shock kits for the Arctic Cat Wildcat and Wildcat 4, the Can-Am Commander and Maverick, the Kawasaki Teryx and Teryx 4, the Polaris RZR 800, RZR XP 900, RZR XP 4 900 and Jagged X Edition RZR, and the Yamaha Rhino. They are currently working on kits for the RZR XP 1000 and RZR XP 4 1000. They can add their kit to just about any shock, but they typically add their kits to Fox, Walker Evans, King and Elka shocks. 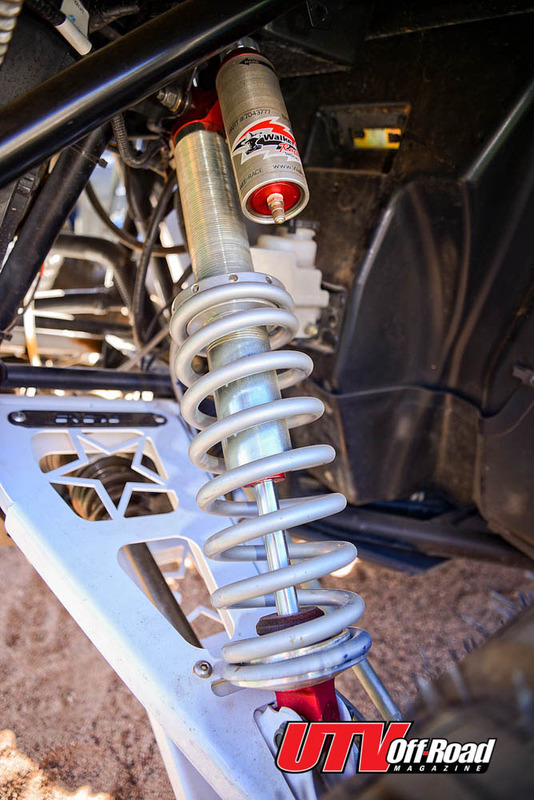 When it comes to shocks, Shock Therapy has over 25 years of off-road race shock tuning experience and can help you improve your suspension’s performance. Their employees have 3 Baja 1000 wins, 2 Baja 500 wins, 2 Parker 425 wins, Rookie of the Year and a BITD championship win, as well as countless smaller race wins under their belts. With a company that races what they tune, they are able to rebuild any manufacturer’s dampeners to give you that race-winning ride. They set up race vehicles every week with their mobile tuning crew, as well as expanding their new UTV suspension tuning kits. No matter what your shock needs may be, Shock Therapy is committed to giving you the best ride possible through comprehensive testing combined with race winning experience. With the shocks off of our RZR, we moved over to the workbench with Shock Therapy’s master tuner Ernie Ely. Ernie has tuned and driven a ton of various vehicles and has a book full of detailed notes for every vehicle he has tuned. Since he has reworked the majority of stock UTVs, he has in-depth knowledge of how the different vehicles’ shocks should perform and can duplicate or make slight adjustments to the tune depending on the customer’s input. Once inside the shock, they diagnose if you have any worn internals that need to be replaced. With everything in good condition, Ernie begins disassembling the shock to gain access to the valving and piston. The valving consists of discs of sheet spring steel called shims. The different sizes and thicknesses change the shims’ strength. Shims are stacked on top of each other, generally from small to large, as they move toward the piston. Some valving may require dual stacks or more to achieve the desired tune. Working on our front 2.0 Walker Evans shocks, Ernie made a few modifications to the piston before he began stacking shims. This is one of Shock Therapy’s cheats that is a trade secret and allows for a plush ride over washboard trails at any speed. For the rear 2.5 shocks, a new modified piston is installed. Next, he began to stack shims on both the rebound and compression side of the piston based on his notes from a previous RZR XP 4 900. Depending on what you want to do with your ride quality, the way you stack the shims is another way to cheat on the valving. You can achieve a plush ride similar to the XP 1000 and a big bump stage by stepping the shim stack. For everything to work with Shock Therapy’s modifications to the piston and valving, they also replace the shock oil with specific viscosity full synthetic race oil for cooler operating temperatures that will increase the over bottoming resistance. With the shocks installed back on our RZR, we headed back to the same section of desert prior to making any adjustments or modifications. To start, the shocks are set on their softest compression setting (16 total). Traveling on a dirt road littered with small washboards on the way to our test track, we immediately noticed a huge improvement to the ride quality. The new set-up allowed the suspension to work freely over the chatter to the point that it was non-existent. Our first run on our test loop we felt the suspension was a little too soft, as we bottomed out the front shocks through deep G-outs and wash transitions. The rebound improvements were spot on, as the rear suspension soaked up the biggest hits and settled back to ride height before the next big hit. The machine now exhibits quite a bit more body roll, similar to the Wildcat and new RZR XP 1000 machines with more travel. It is important to state now that our RZR is running 30×10-14 ITP Ultra Cross tires, adding to the feeling of body roll around corners. We also run a stiffer rear swaybar from Congnito Motorsports. To remedy the bottoming out, we dialed the front shock compression clickers up 6 from the softest setting and left the rears alone. We ran the same course again and now could actually drive like we like to drive. No more bottoming out on big hits, and the small- and medium-sized bumps were smooth compared to our first base run prior to revalving. We did a once-over around the machine and noticed the rear tires were rubbing a little on the bottom of the diver side air chamber box. A few clicks up from the softest setting remedied this issue. We are impressed with the changes Shock Therapy has made to our shocks. They were able to make adjustments to our stock shocks to the point were we feel it would not be necessary to upgrade to aftermarket shocks. They are plush as we ever thought possible due to a few tricks they did on the internal piston, as well as their valving. They created a huge bump stage, allowing the vehicle to take the biggest of hits with impacting your spine through their compression valving and shock oil change. The shocks seem to have more travel (they don’t) allowing you to tackle some seriously rough terrain while your wheels keep constant contact with the ground. The reworked Walkers achieved a smoother ride over bumpy terrain and still offered amazing bottoming resistance. Now the clickers respond well to adjustments, allowing you to stiffen up the ride for more passenger weight. Ernie did mention that in the dunes we would have to add a few more compression clicks, allowing us to cover both terrains with the same shock. For around $500 you can add some life to your stock shocks, which saves you money while enjoying a faster, more comfortable ride. Stay tuned for next issue as we pit our reworked Walkers against the top-of-the-line Fox Factory Series Podium RC2s. 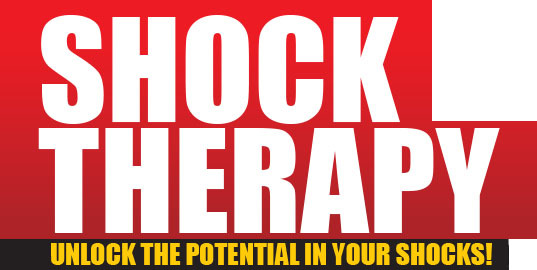 For more information about Shock Therapy, visit their site at www.shocktherapyst.com or call (623) 217-4959.